Montage is part of our 2015 “Must Haves” Product guide, and they’re sponsoring this fun giveaway. 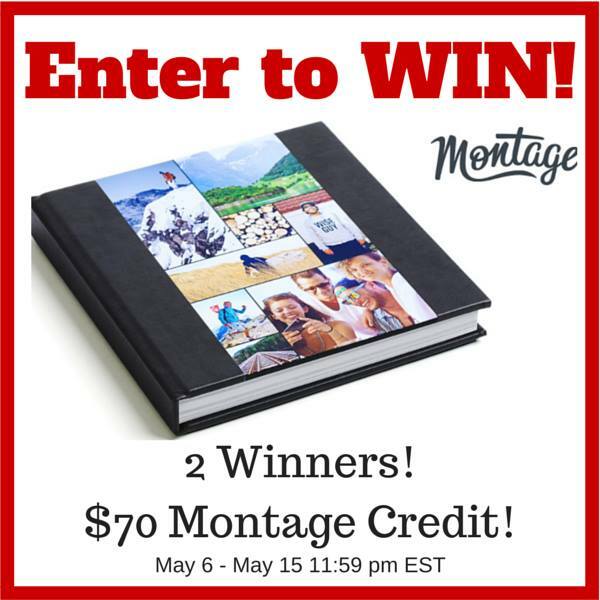 Two winners will win a $70 credit to make their very own Montage Photo Book! These photo books are beautiful AND super easy to make. Here’s a little more info on Montage. As long as photo books have been around, they have taken a long time to create. Transferring photos to your computer, uploading them to the web, choosing and customizing templates, book types and sizes — it’s all very time consuming. Plus, it can take several days for photo books to finally arrive at your doorstep. But everyone loves the final product, once they finally see it. Now people can love the creation experience as much as the end product – with Montage. 2 WINNERS! $70 Montage Credit each. Enter via the Rafflecopter below. Giveaway will run 5/6-5/15 11:59 pm EST. Montage is responsible for prize fulfillment. We are planning to go to Yellowstone. Nothing actually planned and concrete but we always are doing lots of fun stuff. Theme parks, swimming all the time, fishing, and I can’t wait to go camping! We plan on eating lots of strawberries, blueberries, and watermelon and spending lots of time at the pool! Lots of beach time is in store for us this summer! Our plans for the summer are to take a trip to Illinois and visit my husband’s family! It’s a something we’ve wanted to do for a long time.